One thing I love about winter holidays starting with Thanksgiving is that it is just one holiday after another. With everyone hibernating inside during the colder months, it makes sense to decorate the house and get into the holiday spirit. With Christmas ending over a week ago and New Year’s Eve/Day done, Valentine’s decorations are going up. In all honestly, I get a little sad taking down Christmas decorations as it leaves a big, empty space in the house open. Maybe this is why I get started on Valentine’s Day early. Here is a kid friendly craft to get the kids started on early. 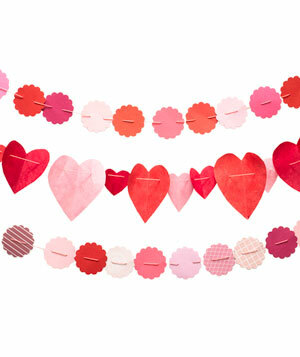 Simple heart cutouts strung on tread to create a beautiful banner. Easy Valentine’s Day Garland for a kid friendly craft! Fold 3” to 6” paper squares in half and cut a half heart from the fold. Thread needle and string hearts together through the top center of the folded paper hearts. Using scalloped hole punch, make shapes from paper. Thread needle and string through the opposite sides of each scalloped paper. Add as many hearts and scallops as it takes to reach your desired length.